Form: Stalked and branching-erect. The branching is usually dichotomous, and the branches are simple or coalescent, cylindrical in cross- section. The exaggeratedly bushy, much-branched, forms seem to be typical of estuarine or strong current conditions. Under extreme conditions the coalescence of the branches may be almost total, leaving a fist-shaped form. Colour: Usually pale yellow/beige, but lilac or pink forms have been reported (due to symbiotic algae?). New growths tend to be pinker. Consistency: Very soft and elastic near the branch tips, becoming firmer near the base. The base may, in older specimens, be very firm and elastic (never wiry). 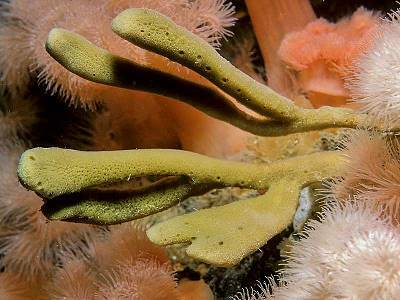 Unlike many other branched sponges, there is no strong central core to the branches. Surface: Even textured, soft, and very slightly velvety, but not markedly velvety as Axinella dissimilis (q.v.). Apertures: The oscules are small (0.5 - 2mm diameter), round, neat, slightly raised, and remain easily visible even when the sponge is removed from the water. Usually serially arranged along the edges of the branches. Numerous. Skeleton: A regular anisotropic reticulation of spongin fibres. These surround singly or biserially arranged megascleres (short fat oxea), which form a single spicule network at the branch tips. 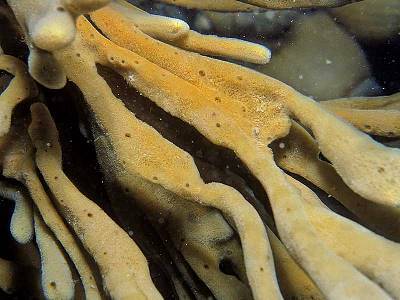 The spicule fibres tend to be formed nearer the base, increasingly surrounded by quantities of spongin. "Quantity of spongin variable, increasing with age." Spicules: The spicules are short fat oxea 80-140µm long, usually less than 100µm in UK specimens; width 5-13µm. There are no microscleres. Habitat: In sheltered but fast-moving water, rapids, estuaries, straits, where it can tolerate high levels of siltation. Also on vertical rockfaces in exposed open-coast conditions, where it usually forms single stick-like, unbranched colonies, or sparsely branched colonies. Distribution: "Arctic; British Isles", including North Sea coasts; "Atlantic coasts of Europe south to the Channel; etc." Known recently from the Menai straits, many channel coast locations, entrances to sea lochs in Scotland and Ireland, and offshore rocky sites. Identity: By eye alone, if very soft and elastic, with branches that are even in diameter with neat, round, easily visible oscules. The absence of a strong central core distinguishes Haliclona oculata from Raspailia and Stelligera (q.v.). Voucher: BELUM : Mc528. Sherkin Is., Cork. Editors: J.D. Guiterman, D. Moss, B.E. Picton.